fanatics including two-year-old Phillie Phanatic. Championship. Because 1980 was the first. Street. Millions of fans lined the street completely filling the sidewalks and intersections. red. The City of Philadelphia was a champion. Terry had only managed in the minor leagues when we hired him as manager following the 1996 season. The night before his press conference, GM Lee Thomas had Terry and a bunch of us front-office types to Lee’s Bucks County home for dinner. At one point, it was suggested Terry and I review the press conference plans. We went into the kitchen and sat down at the table. I had thought of some questions he might face. After a couple of questions, I realized Terry didn’t need much coaching. He was going to be fine. “Just be yourself tomorrow,” I told him. Terry survived the press conference and his four years as the manager. His record with us wasn’t very good (285-363). It wasn’t him. We were just way short of talent. He later proved how good he could be as a manager by winning two pennants and two World Championships with the Boston Red Sox. Now, he’s won a pennant in Cleveland. The last time the Indians were in the World Series was 1997. The Phillies had the fourth best draft this summer, according to Baseball America. #1 pick, high school outfielder Mickey Moniak is listed as the best defensive player in the draft and #1 as the closest to the majors by a high school player. He is ranked #2 as best pure hitter and best high school player. LHP Kyle Young is #2 as the best late-round pick. The 6-foot-10 lefty was selected in the 22nd round out of St. Dominic High School, Oyster Bay, NY. 1B Brock Stassi, the Eastern League MVP while playing in Reading in 2015 who spent last season with AAA Lehigh Valley, is hitting .333 in the Venezuela Winter League with 11 hits, 13 walks and 10 runs scored in 10 games . . . CF Carlos Tocci (Clearwater) is hitting .308 in 10 games in the same league and leading his club with 12 hits. 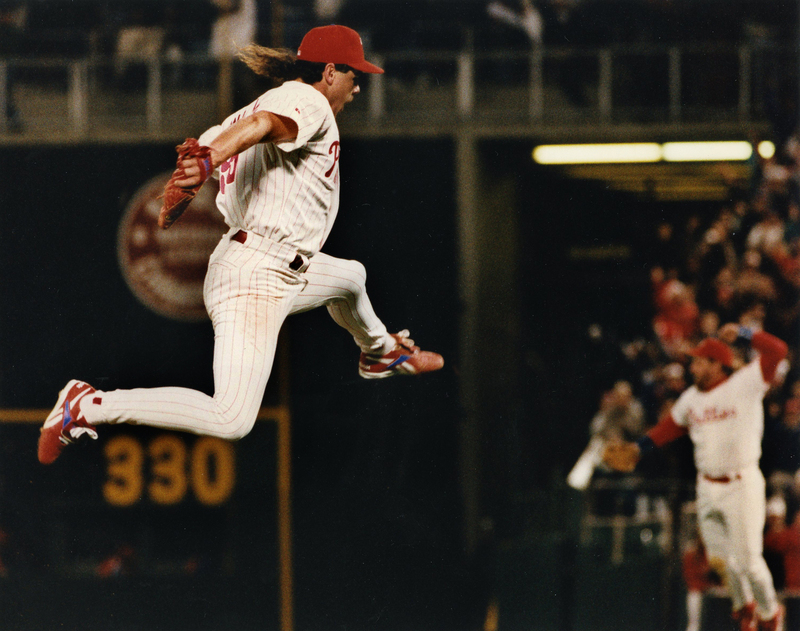 Reliever Larry Andersen is the first Phillies pitcher to appear in two World Series. He did it as a 30-year old on a team called the “Wheeze Kids” in 1983 and as 40-year old on a team labeled “Misfits” in 1993. Stats: 6 games, 0-0, 7.04 ERA, 7.2 innings, 6 runs, 3 walks, 4 strikeouts. On the good news side: 0 balks and he didn’t get to bat. 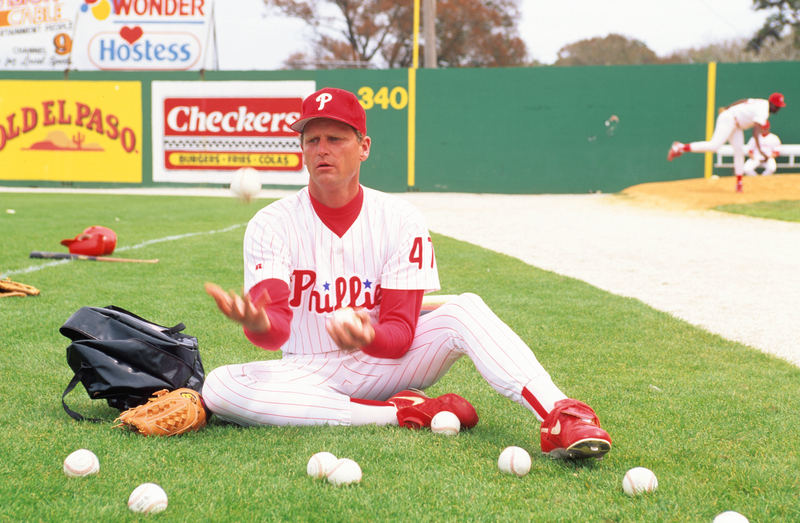 In spring training of 1993, he demonstrated his vaudeville juggling act. Just a naturally-talented dude. Back in August, Jake Thompson became the 2,000th Phillies player since the franchise was established in 1883. Two thousand different people, with all kinds of different stories and all kinds of different names. Kenny Ayers, Phillies communication department assistant, took a look at some of them starting way back at the very beginning. His clever and entertaining story appears in http://www.phillies.com/alumni. An excerpt from Kenny’s story: “And who could forget the winner for the most Philadelphia name of all time, Pretzels Pezzulo.” He was a left-handed pitcher back in 1935-36. According to Wikipedia.org, Pezzullo earned the nicknamed “Pretzel” after his unusual pitching style. (Wednesday’s Weekly Reader….first in a series of folks behind the scenes with the Phillies, Rand Stollmack, the bullpen guard at Bright House Field). A game-day staff consists of an army of men and women who work for sports teams during games. Their duties are far-ranging. Their importance to a fan’s game experience is monumental. Their value to a sports team is immeasurable. 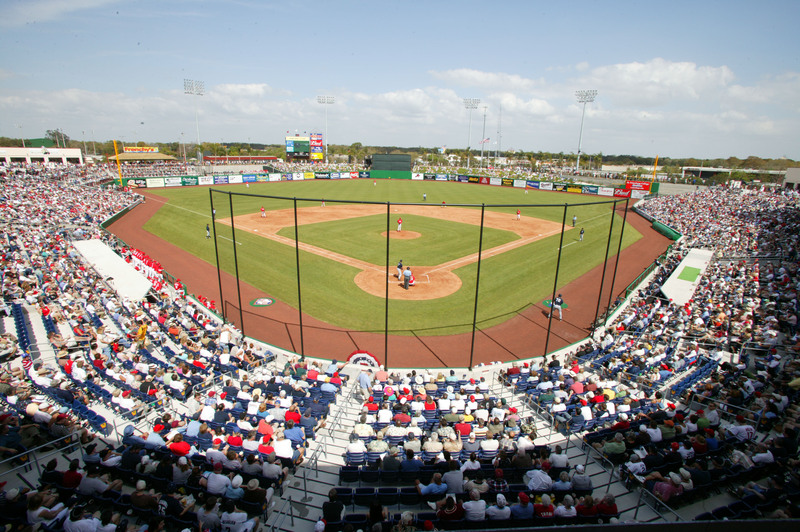 The Clearwater Threshers employ about 500 game day employees at Bright House Field for spring training and their Florida State League season. One is Rand Stollmack, whose assignment is Bullpen Security during spring games. During the FSL season, he’s an usher since a Bullpen Security person isn’t necessary. He’s been a game-day employee since 2012. Wearing beige shorts, a Navy blue BHF golf shirt, sneakers and a red Phillies hat, Rand arrives at the ballpark around 9:30 a.m. for a 1 o’clock afternoon game. “I wipe down all the seats and railings in the bullpen,” he explained. He then heads for the stands where he’ll wipe down three sections of seats before returning to his bullpen post for batting practice. First, a quick stop in the media workroom to pick up the visiting team’s roster. Towels, water cooler and cups are supplied by the Phillies clubhouse. “You have to be very alert during BP because the balls come flying out here,” he said while his eyes were glued to the field. Why an enemy roster? “Need to know the visiting team’s bullpen coach. Always introduce myself and let them know I’m here to help anyway I can.” On this day, the Boston Red Sox are the visiting team in March of 2015. The padded gate to the bullpen is open during BP and closed once the game begins. It can only be opened or locked by pushing a couple of green control buttons on the back of the door. In other words, no one can get in or out of the bullpen by pushing or pulling the door. When one enters the bullpen area, there are seven steps, a level area of about six feet in length and three more steps. Up the first flight of steps is a chain-link fence and door on the right which is visiting bullpen. On the level area, an opening on the right leads to a long row of green colored, high-top, patio-like chairs. Three more steps takes you to the back of the pen and another chain link area, the Phillies’ bullpen. The pitching mounds are made out of dirt and clay while catchers do their work on an artificial surface that looks like Mother Natures’ dirt. In between, rich, green grass. Two pitchers can warm up in each pen. 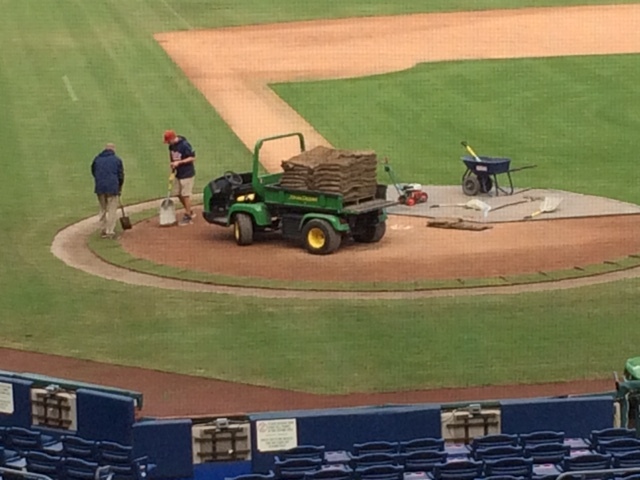 A tarp is rolled up behind the mounds in case of rain. The players sit on the green high chairs. The first 12 are for the Red Sox, the last 12 (toward centerfield), the Phillies. A large trash can, small gate to the Phillies pen and pile of towels separates the two groups. Each seating area has three red umbrellas to shield the sun. A big, blue Powerade cooler sits on top of a concrete ledge between the two bullpens and is very popular. While Rand has his own high chair, he seldom sits. He’s constant motion. If you stand on the flat area on top of the seven steps, you can barely see the batter. The big video board is behind but the line score can’t be seen. The auxiliary scoreboard mounted on the upper first base level is the link to the score and inning. A better glimpse of the field can be found standing at the back of the Phillies bullpen. The only other sightline is peeking through a three-inch opening in the bullpen door. Rand will station himself there when there are two outs. After the third out, he opens the door and stands on the warning track. After the Red Sox hit, someone from their bullpen crew enters the field with two baseballs, one for the centerfielder who’ll play catch with the right fielder and other for the bullpenner to do the same with the left fielder. Same takes place when the Phillies are taking the field. Rod Nichols is the Phillies bullpen coach; Dana LeVangie, Boston’s. How do they communicate with the dugouts? Rand explains, “We have a phone line to the dugout for each team.” The visitors is mounted on a concrete wall outside their bullpen; same for the Phillies. On top of each gray box is a blue light. It will flash when the phone rings. The dugout phone also has a flashing light when ringing. Sometimes the phones don’t work. Rod and Dana are armed with walkie-talkies. When Boston’s phone rang, Dana was at the far end of the bullpen standing behind a pitcher warming up. He didn’t hear it or see the flashing light and didn’t move. Rand got Dana’s attention who yanked a walkie-talkie out of his back pocket. Starting pitchers this particular day were Miguel Gonzalez (Phillies) and Justin Masterson (Red Sox). Gonzalez did some long-tossing in the outfield before moving to the bullpen. The digital clock on the scoreboard registered 12:41. Carlos Ruiz was Miguel’s catcher. Pitching coach Bob McClure stood behind the chain link fence behind Ruiz. Nichols, arms folded, was behind Miguel. Ken Giles stood off to the side watching every pitch. Masterson was a few minutes behind with his warmup as his team batted first. After the Red Sox hit in the top of the first, Masterson began heading for the stairs. Before he did, each of his 19 teammates in the pen gave him a fist bump. “Things are pretty quiet early in the game,” Rand volunteered. “About the third-fourth inning, it begins to get busy. They’ll be a lot of moving around.” Starting pitchers early in spring training are usually limited to two-three innings. Rand was right-on. The next pitcher began stretching, loosening his arm before starting to throw. After the second inning, more Phillies relievers came into their neighborhood from the clubhouse. Jake Diekman was wearing a red hooded sweatshirt with sleeves cut off at the elbows. The hood covered his head. 82 degrees and a hoodie? “That’s the way he is every game,” reported Rand. By the fourth inning both bullpens began to stir. Rand made sure the chain-link gates behind the catchers were closed so he wouldn’t get nailed by a wild pitch. “We had a college game earlier this spring. The gate was open, a pitch came through the gate and smashed the visiting bullpen phone,” Rand said eyes glued to each bullpen pitch. Fans of all sorts are lined up by the fence above the Phillies bullpen, peeking down at the players. More fans are looking over the fence from the Tiki Bar and at the other end, from the outfield berm. Cell phone cameras are in full use. Wearing all kinds of Phillies gear, it was obvious who they were rooting for. “Hey, buddy, give me a ball” pleaded a man to anyone who would listen . . . “I could have caught that ball” after the Red Sox left fielder didn’t . . . “Go get ‘em, Pap,” after Jonathan Papelbon finished his warm up pitches. “Once in a while, one of the coaches will point out a rowdy fan,” said Rand. “I’ll ask the fan to back off or call security.” On the whole, the fans were in line this day. Rand is a huge baseball fan. “Relievers are the greatest. They have more personality. Remember M&M? (Brett Myers and Ryan Madson)? What a pair of crazies. College kids are the best. They are just having fun, enjoying the game, being in the bullpen. These guys are all about work.” There’s one other difference between the two. “College kids pick up their paper cups, pros toss ‘em on the ground,” he said laughing. Big league bullpens have bathrooms. Not so at Bright House Field. The nearest potty is tucked under the stands in the left field corner, adjacent to the entrance to the Phillies clubhouse. BULLPEN BATHROOM in red letters identifies the room. Bull penners make their dashes between innings. To DH or not to DH? That is the question. Penned by Shakespeare? Most likely not. Back on January 23 of this year a story appeared that the designated hitter was “gaining momentum” in the National League. Three days later Baseball Commissioner Rob Manfred basically said, not so fast. Back in 1973, the American League adopted the DH. The NL didn’t. But wait. When interleague games began in American League ballparks in 1997, the DH appeared. But, not in NL parks. Spring training can vary. World Series, only in AL parks. All-Star Games, same. But wait. Starting in 2008, the DH has been used in every ASG, NL or AL park. Being that the Phillies are in the National League their pitchers get to bat. So, their young prospects in the minors can develop their batting skills for when they reach the big leagues. But wait. The DH is often used in minor league games. Rookie and Class A leagues use the DH in all games. At the AA and AAA level, when both teams are National League affiliates, pitchers may bat. In the AAA Pacific Coast League, pitchers only hit when both clubs are NL affiliates and both clubs agree to have their pitchers hit. So, the total development of pitchers in NL organizations is hindered by the DH. Let’s take a look at a couple of Phillies pitchers. Jerad Eickhoff was signed by the AL Rangers. He never batted in five seasons of minor league ball. Traded to the Phillies in July 2015 Jerad made three starts at AAA Lehigh Valley. Zero AB. Promoted to the majors, he made his major league debut on August 21 in Miami. Third inning, his first pro at-bat, a strikeout. He was 2-14 in eight starts a year ago which is pretty good for his lack of experience. Adam Morgan was drafted by the Phillies and did get to bat, 4-26, in his five minor league seasons. There is much more game strategy in NL games. Managers have to make decisions and well, manage. This has been quite evident in the NL postseason games this month. Then, Monday night, Cleveland at Toronto, ALCS. Trevor Bauer, Cleveland’s starter, left the game in the first inning with a bleeding pinkie. Terry Francona did a masterful job of manipulating six relievers without needing to use a pinch hitter or double switch. Most likely the DH will never be removed from AL rules. Is it time for the NL to adopt the DH? Darren Daulton was the Phillies first DH, June 16, 1997, at Fenway Park in Boston, a game the Red Sox won, 5-4, in 10 innings. Darren struck out in his first at-bat against starter Tom Gordon. Boston’s DH was Reggie Jefferson. Ryan Howard was the first designated hitter in a National League ballpark during a regular-season game when the Phillies played the Blue Jays at Citizens Bank Park, June 25, 2010. Major League Baseball moved the interleague series to Philadelphia due to concern about civil unrest during the June 26-27 G-20 Summit held in Toronto. As the home team, the Blue Jays batted first and the designated hitter was used. From time to time this offseason will include an image that reflects 2016. Pictures help tell a story. 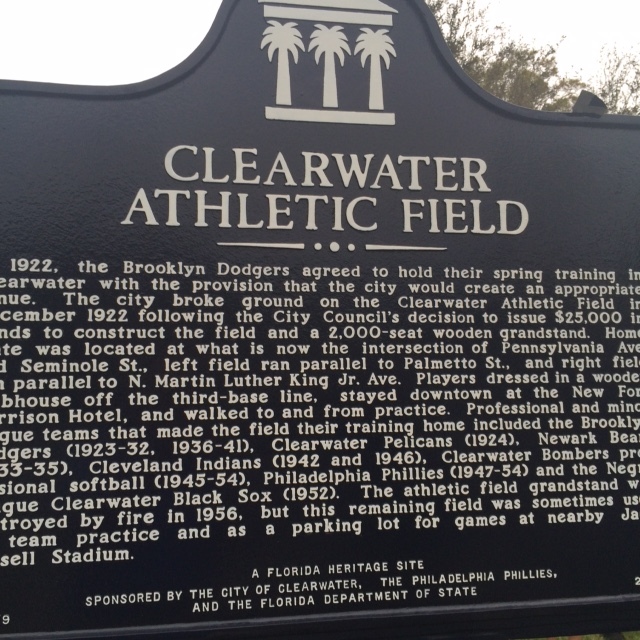 We begin with a historical marker unveiled at the site of Athletic Field in Clearwater back on March 19. 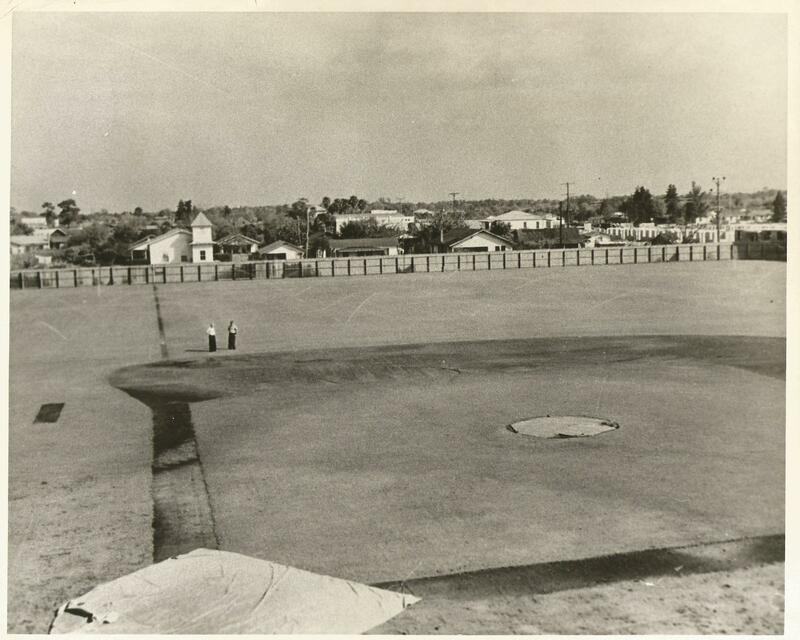 That’s the field were the Phillies first held spring training when they moved to Clearwater in 1947. The marker was a combined effort of the Phillies, City of Clearwater and State of Florida. Photos of Athletic Field are scarce. Baseball author and historian Rich Westcott provided this image. The little white church in left field still exists. Postseason ex-Phillies include: Dodgers—2B Chase Utley, C Carlos Ruiz, RHR Joe Blanton . . . Blue Jays—LHS J.A. Happ, OF Ezequiel Carrera . . . Indians–RHR Jeff Manship, MGR Terry Francona, CH Brad Mills, INF-OF Michael Martinez . . . Cubs—empty roster. Where is Rico Brogna? What is he doing? 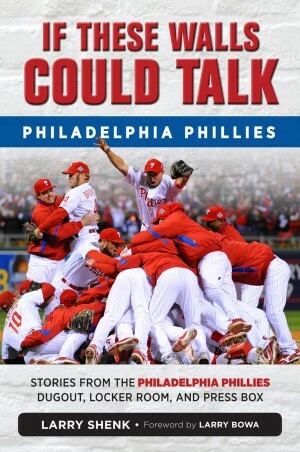 For answers check out Paul Hagen’s “Where Are They Now?” feature at http://www.phillies.com/alumni. RF Chuck Klein is named the National League Most Valuable Player, a Phillies first. He edges RHP Lon Warneke of the Chicago Cubs, 78-68 in points. Klein, 27, led the NL in games (154), runs (152), hits (226), home runs (38), slugging percentage (.646), total bases (420) and 20 stolen bases. Plus, he hit .348 with 50 doubles, 15 homers, 127 RBI. First in a series of behind the scenes features as part of “Wednesday’s Weekly Reader.” Leading off is a day in the life of the bullpen security guard during spring training games in Bright House Field. We’ve seen the Blue Jays, Indians and Cubs celebrate so far this month. Tonight the Dodgers or Nationals will have an on-the-field pile up. Nothing like postseason baseball. the game. 65,502 Phillies went bunkers. 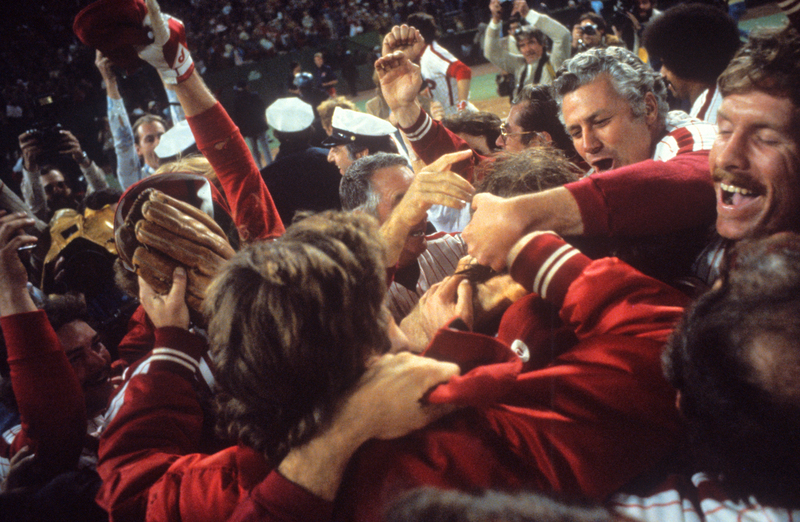 For more postseason memories this weekend, visit http://www.phillies.com/alumni. Traveling To A Baseball Game? Washington, DC, tonight; better hurray . . . Cleveland on Friday and Saturday . . . Chicago, Saturday and Sunday . . . The Arizona Fall League (@MLBazFallLeague) is underway in the Phoenix area . . . So is the Mexican Pacific League and the Venezuela Winter League . . . Dominican Winter League begins October 20 . . . Seven days later, the Puerto Rican League starts . . . Colombian Baseball League, November 4 and Australian Baseball League, November 17. Cesar Hernandez led the National League in infield hits, 34 and bunt base hits, 15 and finished in a three-way tie for the major league high in triples, 11. Last Phillies player in double figures in triples was Shane Victorino, 16, in 2011. Club record holder? Jimmy Rollins, 20, 2007.
rolls weren’t anywhere to be seen. landscape crew was removing the summer flowers and prepping for winter plants . Now that we are in the off-season, Phillies Insider will switch to three times a week, unless there is a major news event. This blog will appear on Tuesday, Wednesday and Thursday. News and notes will appear on Tuesday and Thursday. Wednesday will be “Wednesday Weekly Reader” day, feature stories about Phillies personnel who work behind the scenes. See you Tuesday, October 18. You can’t predict baseball as witnessed by the improbable which has dominated this postseason. And, we haven’t even seen the start of the two League Championship Series, let alone the World Series. Two teams combined for 474 home runs during the season. The Blue Jays eliminated the Orioles, 5-2, in 11 innings on a walk-off home run by Edwin Encarnacion. All seven runs came on homers. Oddly, the Orioles didn’t use their outstanding closer, Jack Britton. Improbable that he would sit for 11 innings in a one-game playoff. NL Wildcard (San Francisco/New York). Conor Gillaspie hit a three-run homer in the top of the ninth off Mets closer, Jeurys Familia, to give the Giants a 3-0 win. Gillaspie is a left-handed hitting bench player signed to a minor league deal in February. He was playing because Eduardo Nunez, the Giants third baseman, was injured. The improbable list goes on and on. The Red Sox scored in the first inning of their first game against the Indians and never led again. Cleveland, without its two best starting pitchers, swept three games from the Red Sox who scored a total of seven runs after leading the universe with 878 in the regular season. Terry Francona had two closers in his pen, Andrew Miller and Chad Allen, and he used them to perfection. In Game #1, Francona brought Miller in the game in the 5th inning. Game #3, the 6th. Allen, in the 8th inning twice. Miller threw 75 pitches in his four innings, Allen 80 in his 3.1 innings. Highly improbable that a reliever throws 80 pitches and comes away with two saves. The Rangers led the AL with 95 wins but the staff ERA was 13th (4.37). Scoring 22 runs, the Blue Jays (89 season wins) swept the Rangers in three straight. Only time Rangers had a lead was 1-0 and 6-5 in Game #3. They lost, 7-6, on a walk-off error. A year ago, the Rangers had a 2-0 series lead over the Blue Jays who won the next three. So, they have six straight postseason wins over the Rangers. 7 runs, 13 hits, 11 innings. Those numbers are the combined totals for two premier starting pitchers, Clayton Kershaw and Max Scherzer, in the Dodgers 9-4 win in Game #1. It wasn’t until Game #4 of the series that a starting pitcher worked into the 7th inning, Kershaw on three day’s rest. Andrew Toles, who was out of the game a year ago, was hit-by-a-pitch in LA’s eighth inning and scored the winning run on a two-out single by Chase Utley. Until then, the Dodgers hadn’t scored a run after the fifth inning in three games. Toles was the 11th batter HBP in the series, an MLB postseason record with one more game to go (Thursday night in DC). Joe Blanton got his first postseason win since Game #4 of the 2008 World Series with the Phillies. Cubs won a classic pitcher’s duel, 1-0, in Game #1. Game #2 was a normal 5-2 score that included an improbable. Cubs’ starter Kyle Hendricks left in the 4th inning with an injury. Travis Wood relieved and hit a home run in the bottom of the inning, the first homer by a relief pitcher in the postseason since the 1924 World Series. Series switched to AT&T Park for Game #3 which turned into a 13-inning classic in which 424 pitches were thrown. The Giants won, 6-5, their 10th consecutive win in a postseason elimination game. The game took 5-hours, 4 minutes, only 29 minutes shy of the total time it took to play the first two games. Want more improbable moments? OK.
**Madison Baumgarner gave up a three-run homer to opposing hurler Jake Arrieta. It was the first home run Baumgarner has given up to a pitcher. **5 runs, 13 hits, 11 innings. Combined numbers of Arrieta and Baumgarner. **Gillaspie, there’s that name again, hit a 102-mph fast ball for a two-run triple off Aroldis Chapman in the 8th inning. It was the first triple ever hit off the fire-balling left-hander by a left-handed hitter. **The two runs were the first the Giants scored off the Cubs bullpen since August 27, 2015. That time was also the 8th inning. Game #4 goes down as one of the greatest comebacks or meltdowns in baseball history, depending upon which team you are rooting for. Trailing, 5-2, going into the top of the ninth, the Cubs scored four runs on four hits and a walk off five Giants relievers. Matt Moore held the Cubs to two runs and two hits through eight innings. His RBI single in the fourth gave the Giants the lead. It was his fourth career hit and second career RBI. The Cubs move on to face the Dodgers or Nationals while the Giants’ streak of winning the World Series in 2010-2012-2014 ends. Their bullpen was largely responsible for those crowns. This year, the bullpen failed. During the regular season, 31 blown saves. Baseball withdrawal tonight as there are no games. Dodgers and Nationals Thursday night for the right to meet the Cubs in the NLCS. 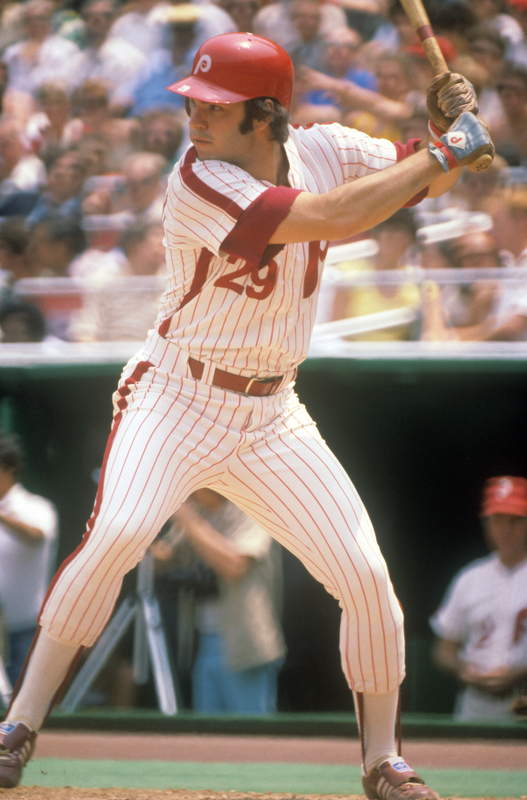 Larry Bowa, a skinny 19-year-old shortstop from Sacramento, CA, is signed by the Phillies for a $1,200 bonus. In the first ever draft that June, 824 players were selected but not Bowa. As a player, coach, manager and coach again, Bowa’s now worn the Phillies uniform longer than anyone else. for a 5-4 win which clinches the series against the Rockies, 3-1. Baseball has a bushel barrel of awards coming up after the World Series, MVP, Cy Young, Rookie, Manager, Roberto Clemente, Comeback, Man of the Year. Ryan Howard is a candidate for the Clemente Award but the Phillies will be shut out on the others. So, my own 2016 Phillies awards. Not sure if these awards are the first annual or last annual, if there is such a thing. Without much run support, Jerad Eichkoff became a battling bulldog on the mound, setting a career-high in innings pitched. A lot to like about his make-up, preparation, maturity. Pete Mackanin, hands down. No matter the situation during the game, he showed the same low-key composure on TV. Wonder if his tummy was churning. Term used to describe the arm of Vincent Velasquez. At times dominating. At times learning bumps. Freddy Galvis who showed he’s of the same defensive mold as Larry Bowa and Jimmy Rollins. Odubel Herrera. Up until the All-Star Game, he was the team’s best and most consistent hitter. Then, a month-long spell in which he looked lost at the plate. Regained everything the final weeks. Maikel Franco’s bat. At times, terrifying power. Other times, puzzling approaches. That was Brad Lidge’s nickname because of his deadly slider. Well, Hector Neris was lights out with a 95 mph fastball and deadly splitter. Cameron Rupp because he’s built like a Mack truck. Withstood three crash tests at home plate. 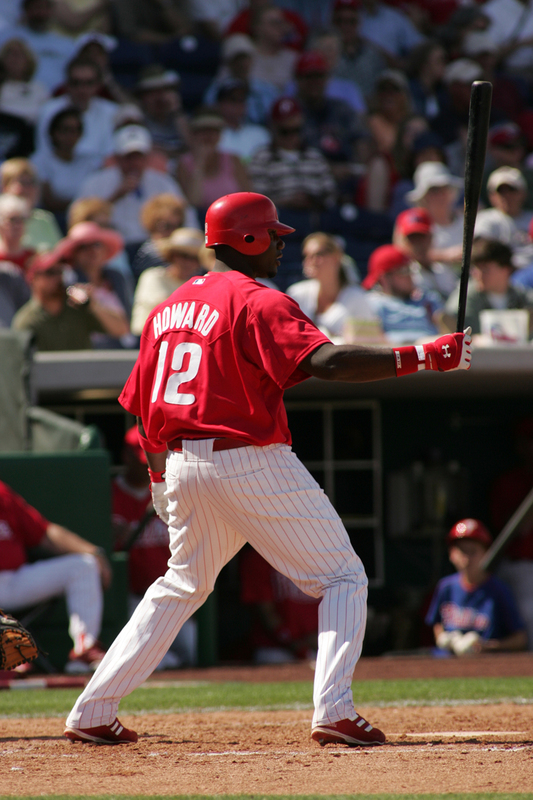 Ryan Howard for handling a tough situation of wanting to play more while sitting more. Jeremy Hellickson. Throw strikes, change speeds…..consistently. Andres Blanco. Multiple infield positions, defensive replacement, pinch hitter, mentor to young Hispanic players, clubhouse presence. Cesar Hernandez who developed into one of the game’s best leadoff hitters, working the pitcher for walks and hittable accounts. In my book, Freddy Galvis. Durable, plays with energy, extra-base pop, career-high in steals, off-the-charts defense. Three young pitchers, Zach Eflin, Jake Thompson and Adam Morgan. First two got clobbered in their debuts but bounced back. Morgan had a 7-game losing streak in the bigs, went to the minors where he won 6 in a row, returned as a more competitive hurler. Jeanmar Gomez, a good set-up reliever surprisingly emerged as the closer who carried the team for five months before crashing. Edubray Ramos, a 23-year-old that began the season in double-A ball and wound up as the seventh-inning specialist. Pitching coach Bob McClure made so many mound visits he got more TV exposure than Donald and Hilary. Tommy Joseph. After three straight seasons with concussion issues as a catcher and rehabbing in the Gulf Coast League he returned to AAA at first base in April. Then, impressive power in the majors. past years. Do you remember? Bruce Bochy to score the winning run. Five-game series tied, 2-2. Expos win, 3-0. Montreal wins the Series, 3-2. Phillies a 21 win in Baltimore in the first “I-95” World Series game. Atlanta, 43. Phillies lead Series, 3-2. Director of Amateur Scouting Johnny Almaraz and his staff spent a few days observing the Instructional League players. They also began the process of working on the 2017 draft in which the Phillies will select eighth in the first round. Early indications are that the draft is heavy with college players . . . 2B Josh Tobias left the instructs camp to get ready to play ball in the Colombian Winter League . . . Aaron Nola is throwing and has shown no ill effects . . . The FIL ends on Friday . . . The Arizona Fall League (@MLBazFallLeague) begins play on Tuesday. Phillies have seven players on the Scottsdale Scorpions . . . From the Venezuela Winter League, OF Herlis Rodriquez hit for the cycle, stole home and went 4-5 with 7 RBI on Saturday to lead Zula to a 16-3 win over La Guaira. The 22-year-old hit .294, 10 HR, 61 RBI at Lakewood in 2015 but injuries limited him to 48 games and a .213 average this season at Clearwater. ICYMI. The Phillies made their first wave of roster moves last Friday as they begin preparing for the 40-man off-season roster. Sent outright to AAA were Emmanuel Burris, Frank Herrmann, Dalier Hinojosa, Colton Murray, Jimmy Paredes and Patrick Schuster. More space will become available when players begin filing for free agency following the World Series. With the success of their minor league system the Phillies will have more prospects that need to be added to the roster and not risk losing them to the Rule 5 draft in December. Phuturephillies.com reported that two players on the Lehigh Valley roster, outfielder Cedric Hunter and left-handed pitcher James Russell, have chosen free agency. The Phillies were last in the majors scoring 610 runs. Well, here’s some good news…that total isn’t even close the club record for fewest in a season. The 1942 Phillies scored 394 runs in 151 games, that’s an average of 2.61. Even more shocking, they hit a total of only 44 home runs, one coming from a pitcher. Final record: 42-109, 62.5 games out of first base. Thankfully, I don’t remember that season. Wasn’t much of a Phillies fan as a four-year-old. Unless you just arrived back from Jupiter (the planet, not the Florida city) and aren’t aware, baseball’s postseason has been in full swing for the past week. Former Phillies are everywhere, enough to make up a team. Needed a first baseman and third baseman. Terry Francona played there during his career. So he becomes the playing-manager. Ruben Amaro Jr. played all three outfield positions plus first and second in the majors. His dad, Ruben Sr., was a slick-fielding infielder. Let’s assume Jr. acquired those genes and put him at the hot corner. National League Division Series at 2-2.
division when the strike started, were declared the NL East first-half champions. Montreal won the second half creating the first Division Series. Happy Birthday: Placido Polanco (1975), Pat Burrell (1976). Phillies get their first postseason series sweep and advance to the NLCS. When raising children, you love them but at times you want to spank them. It seems the same can be said of the Phillies position players, the third youngest group in the majors this past season. In terms of major league experience, very young when you consider the core of Odubel Herrera, Cameron Rupp, Cesar Hernandez, Freddy Galvis and Maikel Franco were basically in their second year of playing every day. Then there’s Tommy Joseph who came out of nowhere. Of this group, Rupp, at age 27, assumes the title as a grizzled veteran. Flashes of potential and flashes of frustration summarized the offense. Six different Phillies hit 15 or more home runs but six struck out over 100 times. Their inexperience often showed at the plate with pitch recognition, pitch selection, working the count, moving base runners and making contact with runners in scoring position. Base running at times was puzzling with numerous mental mistakes. The final numbers showed the Phillies were last in the league in runs scored, doubles, walks, OPS, total bases, sacrifice flies and were second from the bottom in average, on-base percentage and slugging percentage. Bleak but not hopeless. Galvis’ 20 homers doubled his big league total. In addition his offensive numbers were up in doubles, RBI and stolen bases. His walks went down, strikeouts up and OBP was low. Seems to me people complained that Jimmy Rollins didn’t reach base enough and hit too many balls in the air early in his career. Now that Ryan Howard is no longer around, the clubhouse belongs to Galvis as he’s the longest tenured Phillie with five years of service time. Freddy really excelled in the field. He played Gold Glove shortstop. A year ago he had 17 errors, this year eight in 1,350 innings. It is the fewest errors he’s had in a full season in pro ball. He always sparkled with his glove in the minors. Love this photo from Dave Schofield when Freddy was playing in Lakewood in 2008. Galvis and his double-play partner, Hernandez, were signed on the same day by the Phillies, July 2, ten years ago. Hitting just .248 on June 20, Cesar sat for three days and returned with a 4-for-4 night in Minnesota. From then on, the 26-year-old turned into the consummate lead-off hitter, bunting, walking, base hits, working the count. Led the league in infield hits (34) and bunt base hits (15) and tied for the most triples (11). Granted his speed didn’t relate as a base runner, 17 steals, 13 caught. Much better the year before, 19 out of 24. Consistency is the key to becoming a solid major league ballplayer. Franco has shown amazing power but also spells of swinging wildly. In early July, homers in four straight games. Then none from August 19-September 21. He ended the first half with 18 HR, 52 RBI and a .269 average. Second half, 7/36/.238. The 24-year-old has played a season and a-half in the majors, 39 homers, 138 RBI. Keep in mind: 18 home runs, 52 RBI, .196 average, 23-year-old Mike Schmdt’s first season in the majors. Herrera impressed as a rookie a year ago with his hitting ability. Worked on becoming more disciplined at the plate and it worked for half a season. First three months, 42 walks, 59 strikeouts. Last three, 21/75. Before the All-Star Game, .294; after, .277. Another 24-year-old who needs a more consistent approach at the plate and defensively in centerfield. Rupp showed decent power and a strong arm a year ago. This year, more power but not as efficient in throwing out base stealers. Among NL catchers he finished third with 16 home runs and a .453 slugging percentage. Concerns with his game calling? Heard the same thing about Bob Boone, Darren Daulton, Mike Lieberthal and Carlos Ruiz as young, inexperienced catchers. Cameron has unbelievable power straight away and to right field as demonstrated in his two-year home run log in baseball-reference.com, 9 to right, 8 to center and only 3 to dead left. Joseph, 25, had to change positions from catcher to first base because of multiple concussions behind the plate. He re-signed with the Phillies last winter after no one else showed interest. Hitting .347 with six homers in 27 games at Lehigh Valley, the Phillies brought him up in need of more power. Finished with 21 home runs, the most by a Phillies rookie in 45 seasons. The Phillies are the only team ever to have two first basemen with 20 or more home runs. The Phillies will be looking to add some more offense this off-season. Most logical area is the outfield. After Herrera’s 15 home runs, Peter Bourjos was next with five. More offense can be obtained by a trade or free agency and it could come from within as the core matures at the plate. It could also come from the minors at some point next season, the likes of OF Roman Quinn, SS J.P. Crawford, OF Nick Williams, C Andrew Knapp, C Jorge Alfaro, 2B Scott Kingery, RF Dylan Cozens, OF Andrew Pullin and 1B Rhys Hoskins. Building a winning team takes time and patience. Walk in the Phillies clubhouse at Citizens Bank Park and you’ll find a rather empty room. 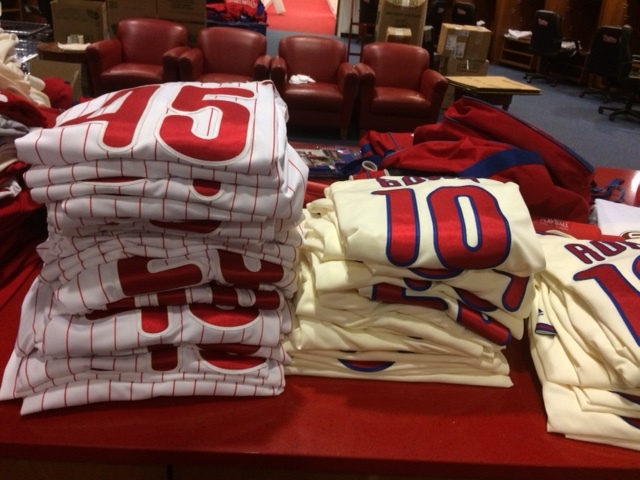 Oh, piled on a table in the middle are Phillies uniforms. Instead of hanging in lockers, they are folded ready for a long winter’s nap. Name plates are still above the lockers, except one, 6 Ryan Howard. It is probably on display in his trophy room. One player was still packing a box with his belongings Wednesday morning, rookie Zach Eflin. He recently underwent surgery on his left knee and was wearing a full-length immobilizer on that leg. Same surgery on his right knee came first. He’s expected to be fully recovered in time for spring training in mid-February. Most other players have already departed Philadelphia. Under Major League Baseball rules each team is required to provide a check for one first-class airfare to the player’s home. The money can be used to fly or drive. Boats or hiking are probably out of the question. Come Clearwater one can expect to see the same uniform jersey numbers. However, many names on the back will be different as new faces will help fill the Bright House Field clubhouse. The Phillies’ Communications Department provides 10 pages of GAME INFORMATION, oodles of notes and numbers for every game. Yep, all 162 games. Same for the other 29 teams. In addition, the MLB Information System provides every press box with a statistical package, 52 total pages. There are more numbers than one can digest. Only thing missing are players batting averages when there’s a full moon. Not true but you get the point. 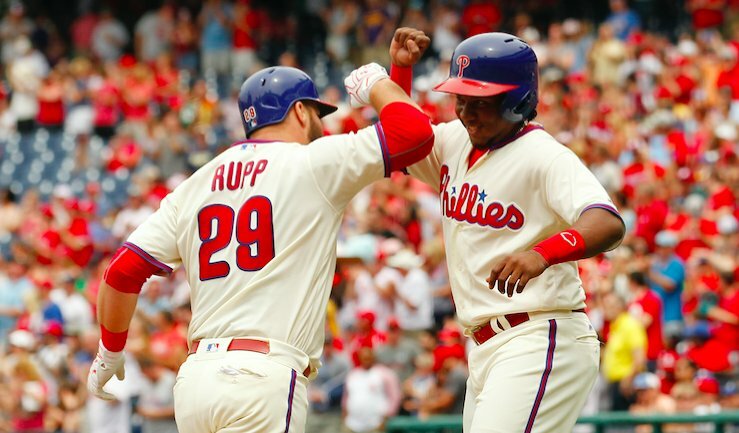 In looking over the Phillies final GAME INFORMATION, two numbers stand out among the many: When the Phillies scored four or more runs, they were 57-26. Three or less, 14-65. Now I’m not a sabermetric genius but those numbers tell me the Phillies had solid pitching and not much offense. GM Matt Klentak’s goal a year ago was to improve the outfield defense and accumulate pitching depth. The basis: pitching and defense keep you in the game. Also, you can never have enough pitching. Overall, the Phillies were a young team. The 37-player September roster averaged 26.9 years of age. Seven were 30 or older and most of that group won’t return. The average age of the pitching staff was 25.3. Matt Gelb of philly.com had an interesting note after the season: the Phillies started a pitcher 27 or younger in 124 of their 162 games. That number would have been even higher when you consider Aaron Nola, 23, didn’t start after July 28 (elbow injury), Zach Eflin, 22, saw his season end on August 8 (knee injuries) and Vincent Velasquez, 24, didn’t start after September 3 because of a season innings limit. 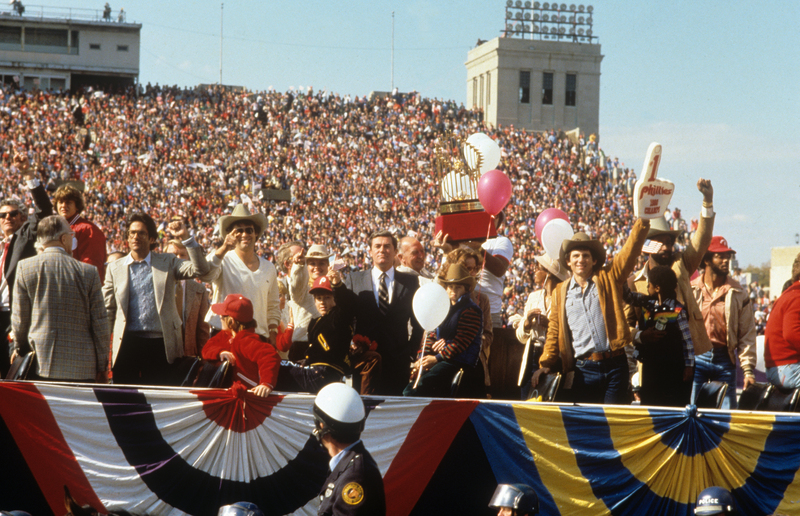 Youth can mean excitement and despair, spurts and lulls, high-fives and head scratching. It was all there this season. Offensively, defensively and on the mound. Jerad Eickhoff and Jeremy Hellickson were the most consistent starters and the only two in the rotation all season long. 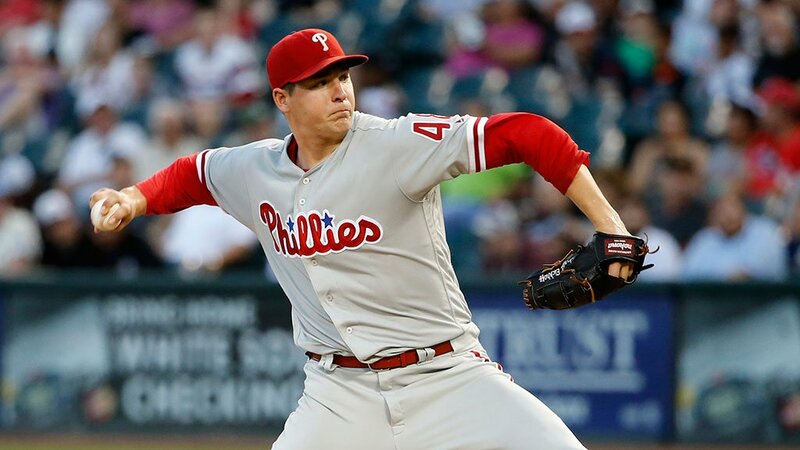 Eickhoff developed into a workhorse in his first full big league season. He finished 11-14 with a club-low 3.65 and club-high 197.1 innings. Greater run support could have easily flip-flopped his record. Hellickson was the consummate pro who demonstrated throwing strikes and changing speeds are the keys to getting outs. He was a steadying influence for the young staff. Who’s the closer? That was an unanswered question at the start of the season. 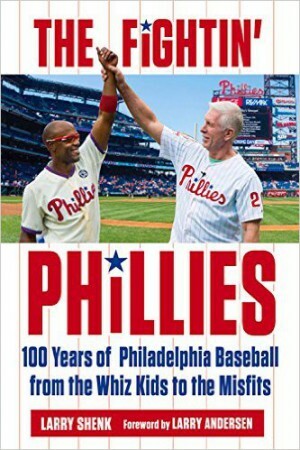 Losing the first four because the bullpen imploded forced Pete Mackanin to stick Jeanmar Gomez on the mound April 9 in New York trying to protect a 1-0 lead. He did and the Phillies had their first win. Gomez carried the team, saving 30 of his team’s 56 wins through August 14. With rookie Edubray Ramos in the 7th, Hector Neris in the 9th and Gomez, the Phillies had a stable back of the pen. On August 14, the pen was 18-17, 4.25 with 35 saves in 44 opportunities. Gomez began to struggle and it snowballed. After August 14, the pen went 4-11, 7 saves, 18 blown saves and a 5.01 ERA. The Phillies limped to the season’s end. Pitching is controlling the strike zone with your fast ball. The young starters lacked consistency in establishing their fast ball, in putting batters away early which turned into high pitch counts which turned into too many five and six-inning outings. As a result the bullpen was used often. It caught up with them in the last six-seven weeks. In 2015, the Phillies had 14 different pitchers make starts. Included were Aaron Harang (29), Jerome Williams (21), Sean O’Sullivan (13), Chad Billingsley (7), Kevin Correia (5) and Phillippe Aumont (1). That’s 76 total starts. Yikes. Hellickson can become a free agent and could leave. But Eickhoff, Velasquez, Aaron Nola, Adam Morgan, Jake Thompson, Eflin and Alec Asher represent 118 starts. Nola and Eflin will be returning from injuries. Overall, the starting staff was an improvement over a year ago and a building block as this team grows. Adding pitching depth is on the bucket list of every team, the Phillies included. Where do you find arms? Trades, free agents, the Rule 5 draft and the farm system. Stay tuned. (Tomorrow, a review of the offense and defense). Ryan Howard was a father-figure and respected giant on a very young team this season. He was the Phillies last player to be born in the 1970s (11/1979). That didn’t make him a senior citizen. It just seemed that way. What follows is a plethora of notes from the career of Ryan James Howard, enough to fill a notepad. 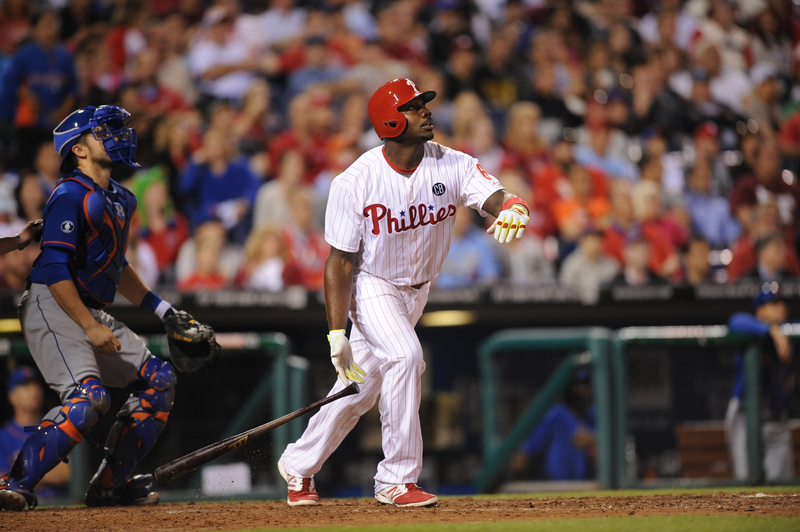 Phillies were 230-122 (.653) when he homered. #1 9/11/04 vs. Mets, Bartolome Fortunato, Shea Stadium. #382 10/2/16 vs. Mets, Bartolo Colon, Citizens Bank Park. 9/1/04, pinch-hitting for Vicente Padilla vs. Braves, 5th inning, struck out looking, 3-2 pitch from Jaret Wright, Citizens Bank Park. 35,031. 10/3/16, vs. Mets, 8th inning, popped to shortstop, 1st pitch from Jim Henderson, Citizens Bank Park. 36,935. A couple other scouts also felt he was better as a sophomore. “Draftitis” and putting pressure on himself with multiple scouts following him were the theories. When it came time for the draft, the Phillies picked him in the fifth round, the 140th player selected. Ryan was a trombone player in the Lafayette High School band in Wildwood, MO. Yep, when he made his major league debut as a 24-year-old in 2004, Ryan wore 12 as Doug Glanville was #6. Same for spring training the following year (Miles Kennedy photo). He switched to #6 when he was recalled from the minors in 2005 (May 3) as Glanville was no longer on the club. Frank Coppenbarger is the Phillies Director of Team Travel and Clubhouse Services. He assigns the uniform numbers to players. As he has done with #11, 26, 35 and 51, 6 will be put in the freezer, as Franks likes to say. In other words, no one else will wear that number for a few years. During his career Ryan was the Big Piece on five division champions, two National League pennant-winners and a World Champion. He was the last link to that magic 2008 season. Seniority in the clubhouse now rests with Freddy Galvis, who at 26 years of age has five years of wearing a Phillies uniform, the longest tenure. The torch has been passed.